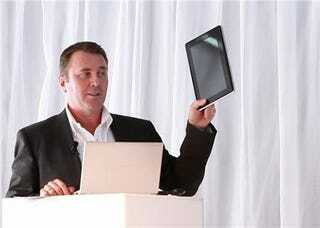 At a press conference celebrating 25 years of laptop-making, Mark Whittard, Managing Director of Toshiba Australia, concluded by showed off a prototype for the Toshiba SmartPad, a tablet he said would hit sometime around October of this year. The suspiciously familiar looking prototype is one of several tablets Toshiba's preparing, relays PC Authority Australia, some of which will run Android and others Windows 7. Whittard didn't say which operating system the SmartPad would run.